As much as I believe in cooking from scratch and doing as much as you can yourself, there are some ingredients that are worth cheating on. 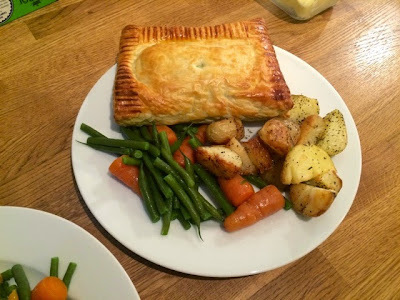 I like to make my own pastry from time to time when I’ve got a whole weekend day to spare and I’ve got loads of time to spend in the kitchen or maybe for a special occasion, but ready made pastry means you can knock up some really tasty meals in minutes rather than hours and can totally mix up your midweek meal habits. 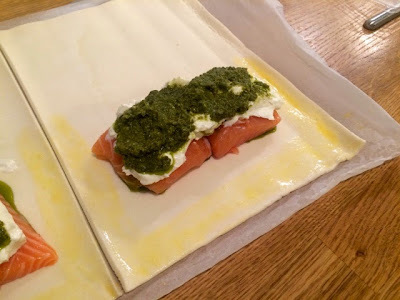 I got this idea from a video on the Jus-Rol Pastry Facebook page where they used salmon and basil as a filling and I thought why not crank that up a notch and use pesto, one of my favorite ever ingredients. I swear I could just sit there with a spoon and eat a whole jar, it’s so yummy. If you do have a bit of extra time, why not make a batch of your own pesto and keep it in a tub in the fridge to use throughout the week? It’s really simple to make if you have a blender or food processor and is so versatile. You could make these salmon parcels one evening, use it as a marinade for chicken another night, use it in a pasta bake and use it to liven up your salad dressings for the week’s packed lunches. Having decided to use the pesto, I then discovered half a tub of cream cheese that needed using up in the fridge and decided to throw that in too, but really you could use all sorts of things to give it the flavour you want. Use a flavoured cream cheese, or fresh tomatoes and basil would work nicely or throw in some peppers, bok choi, chilli and ginger for more of an Asian theme. 2. 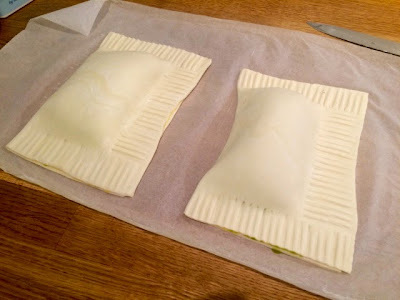 Cut your pastry sheet in half and place each salmon fillet in the middle off to one side, allowing room for the pastry to fold back over and seal the parcel. 3. 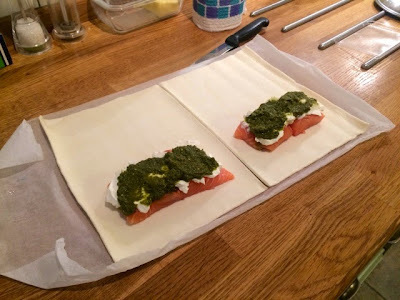 Spread each salmon fillet with cream cheese and then top with pesto. 4. 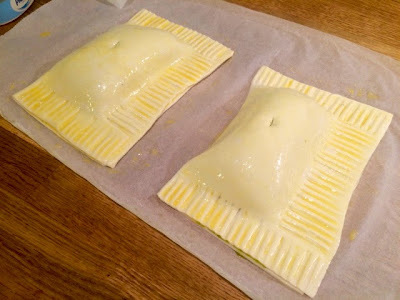 Brush the egg around three side of the salmon where the pastry will meet to close and fold over to seal. Try to keep it as airtight as possible. 5. 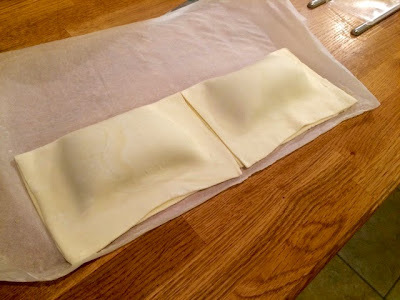 Use a fork to press down and crimp the edges. 6. Use the remaining egg to brush over the top and pierce a small hole in the centre to allow steam to escape during cooking. 7. Bake for 20-30 minutes until pastry is puffed up and golden. 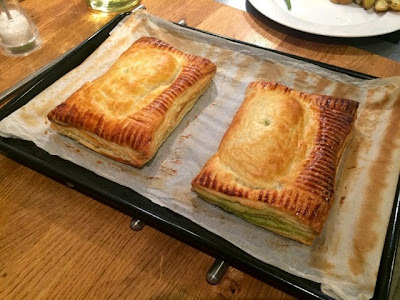 *Top tip: use the greaseproof paper from the ready rolled pastry to cook on in the oven to prevent sticking. 8. 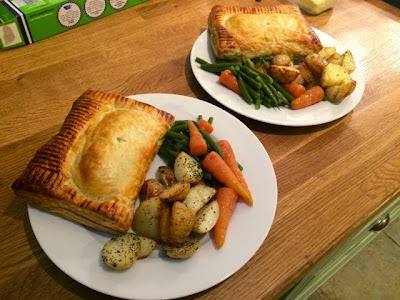 Serve with potatoes and fresh vegetables for a super tasty, quick and easy midweek meal.